What is a Rhinoplasty (Nose ReShaping)? A Rhinoplasty is a procedure to reshape the nose for cosmetic reasons or to improve breathing. It is used change the size of your nose, reshape of the bridge of your nose, change the position or angle of the sides of your nose (ala), improve breathing, or repair the results of injury. Healthy patients who are interested in improving their appearance and/or breathing are the best candidates for surgery. Teenagers should wait until around age 16, depending on the individual, for best results. There are two main types of rhinoplasty – endonasal and open. Dr. Ruas uses both of these techniques depending upon the extent of surgery required to reach the desired goals. The endonasal approach works well if the procedure is limited mainly to the bridge of the nose. The open technique involves lifting up the skin over the tip of the nose. This allows for more precise sculpting of the nasal framework. Often nose reshaping can be done as an outpatient procedure, and you will be able to go home the same day. Someone will need to stay with you for the first 24 hours. Sometimes patients need to stay overnight. You will have a splint on your nose for 5-7 days and a small pad to catch the drainage from your nose. You will not be able to blow your nose for a few weeks. Most of the swelling will go down in the first 2-3 weeks, however it takes several months for the final contour to emerge. The swelling on the tip may take up to a year to finally reach the desired goal. 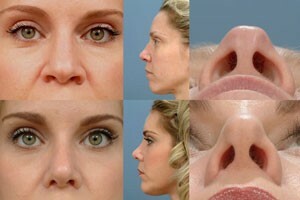 For rhinoplasty in Tampa Florida with board certified plastic surgeon Ernesto J Ruas MD FACS call (813) 259-1550 today.